Hiking for weight loss is just one of the many motivators pulling women onto hiking trails. Can women walk weight off? will help you lose weight hiking, in a gradual and safe manner. And females burning calories hiking? It's a given on a hike. Congratulations for taking the first step down a proven route to feeling stronger and enjoying robust health! 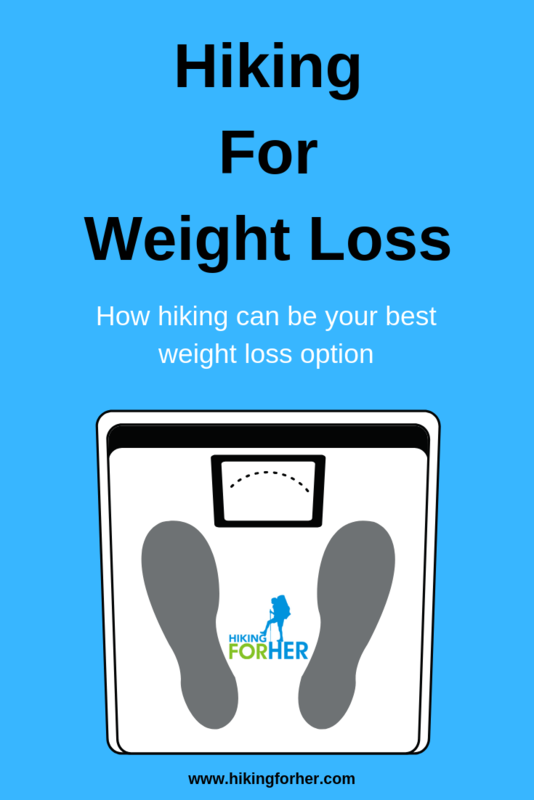 Here are some thing to consider if you're serious about using hiking for weight loss. Every human body is built from one repetitive unit, the cell. Add trillions of cells together, and you've built the human body. Each cell needs water and nutrients and oxygen, as well as efficient waste removal, to exist in its optimal form. Every cell specializes in performing particular jobs in the body. If you're serious about using hiking for weight loss, you'll be focusing on your shrinking the size of you adipose cells (commonly called "fat") cells. To do this, you can't starve your cells by skipping meals or limiting your calorie intake in a severe manner. Because in retribution, your adipose cells become more and more efficient at storing excess nutrient molecules. They "hoard" your energy supplies, meaning that you'll hit a weight plateau and stay there. A better strategy is to work with your cells to redirect your adipose storage and encourage the use of your stored fuels (those extra pounds). This will lead to positive outcomes when you step on the scale or zip up your pants. You might have to "convince" yourself that it's ok to snack regularly on the hiking trail, and sip water frequently via a hydration backpack or water bottle. Don't blame/shame yourself for feeling hungry. You are doing more work than usual, and your body is asking for additional fuel and water to support your muscle contractions. Hikers are supposed to be hungry and thirsty! But there's a danger lurking here, so let's address it head on. Feeling hungry and thirsty are part of being a hiker. But that's not to say that you can eat whatever and whenever you please on a hiking trail. Using your hike as a reason to overindulge in salty or sweet snacks is not going to bring you to your end goal of weight loss as a hiker. So listen carefully to your body's request for fuel and hydration. Stop eating when you first feel that sensation of satiety (satisfaction or fullness). You'll have plenty of rest breaks and snack stops ahead of you on a long hike, right? Read up on the nutrition required for a hiker's body here. For specific advice on how to choose foods as a hiker, go here. For some ideas on hiking hydration, read this. Here's a safe and sane approach to hiking for fat loss, which you can tailor to your specific hiking goals. Choose hiking trails that will challenge, but not defeat, you. Work up to double digit mileage and throw in some elevation gain. Reward your ambitions as a hiker by choosing great destinations. If you can get up to a high point for panoramic views, do it! You'll soon be hooked on this hiking thing for reasons other than burning calories or weight loss goals. Wear high performance active wear designed for women hikers whose size range can be hard to find in athletic clothing (that links calls out the best brands). Go into training for trail time by changing some habits as you condition your body. Make a short but vigorous daily walk part of your self care routine. Wear a hiking pedometer that can also track your weight loss goals, like this one. Or an activity tracker, like this one. Set a daily step goal and gradually increase it until you're at your weight goal. Celebrate your successes with hitting your activity goals (see above). Re-frame the way you see food. It's fuel for your body, it's energy for your muscle contractions, it's a necessary part of being healthy as an outdoor athlete. Don't harass yourself for hunger and thirst sensations. Eat and drink adequate amounts with an attitude of gratitude for your hard working body. Save your favorite chocolate for a trail snack, rather than "at home" food. Slowly savor the taste of nutrient dense, delicious and healthy trail food and think of how your body is using it to bring you to beautiful places. Keep a hiking diary/log/journal of where you've been, what you've seen, and how it feels to be striding down a hiking trail with the weight of your pack on your back. Emphasize your experiences, not your weight loss, as your hiking miles pile up. Realize that hiking is a self-perpetuating cycle of hard work, joy and reward. Over and over again, women who start hiking improve other areas of life, not just how much the scale says or the jeans fit. 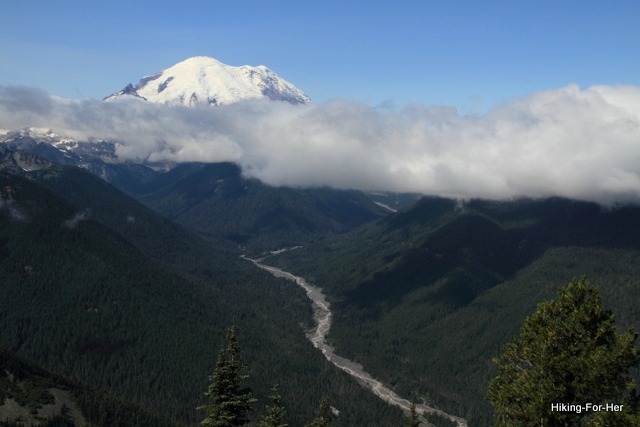 Mount Rainier from Crystal Peak, Washington State, USA. Work this fantastic destination into your plans for hiking for weight loss! Hiking is better than lots of other weight loss options involving exercise. running, because it's not as hard on your lower leg joints. swimming, because you don't have to bathe yourself in chlorine and "used" swimming pool water to get a good work out. biking, because you don't need a dedicated bike trail and don't endanger yourself on a busy roadway. a gym membership, because once you buy your footwear and pack, you're pretty much set in terms of large cash investments as a beginning hiker. a gym membership, because when you're sweaty and out of breath, only your trail buddies (see below) will notice. sitting at home feeling out of shape, because it pumps oxygen to your cells, endorphins pumping up your mood (hiker's high, it's a real thing! ), and gorgeous vistas into your memories. a dance class, because it lasts longer and makes your stronger (duration, stamina). just a quick walk, because it builds up endurance, stamina and muscle tone that will reinforce your motivation once your clothes start fitting differently and you're not out of breath on the stairs. doing nothing, because sitting too much shortens your life span and robs your heart muscle of a much needed work out on the trail. So if you're in a hurry to shed the weight, combine some other physical activities with your hiking plans. Hiking is hard when you first start out, too. Put those 2 facts together, and it's easy to lose motivation and give up your ambition to try hiking for weight loss. But not if you're part of a group which includes gentle accountability! Start this group, or find a MeetUp near you. Take turns choosing a hiking destination and leading the hike. Use the best hiking tips on this website to make trail time enjoyable. Bring new trail snacks to share with the group, with an emphasis on high carbohydrate/moderate protein/low fat nutrients. Check in with each other during the week, just to say hi and to lift each other's spirits when needed. Celebrate weight loss goals together. Keep hiking, no matter what the weather throws at you! Your hiking clothing and hiking gear will protect you. Don't have anyone to hike with or can't find a group near you? Or want to hike with someone else who has hiking for weight loss as a goal? 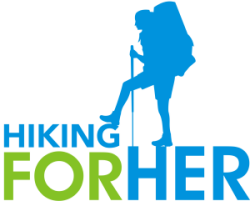 Hiking For Her has you covered! You can also join the Over Forty Hiker community here in Hiking For Her, and find other hikers who have similar goals and may even live near you. Walk the weight off together! Hiking has worked for many women to achieve weight loss goals, and the extra benefits of cardiovascular health, improved muscle tone, and mental well being cannot be ignored. Read this woman's story about how hiking for weight loss (124 pounds) worked for her.